The last couple of months have provided some data points that have raised hopes that the recovery is about to step into a higher gear. Unemployment fell by 0.6 percent between December 2013 and June 2014, and essentially all of the decline was driven by actual job-growth rather than falling participation. 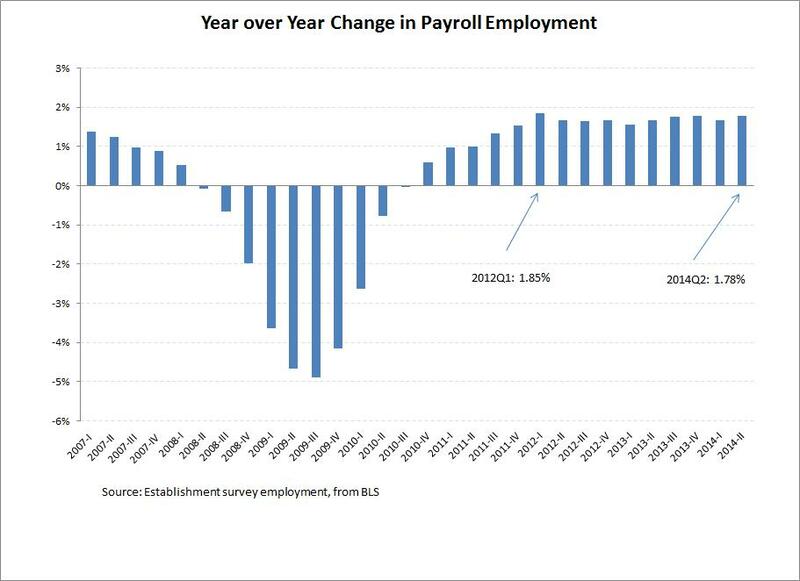 Payroll job-growth for the second quarter of 2014 averaged 272,000, a rate that, if continued, would see us back to pre-Great Recession labor market health by early 2017. Not soon enough, but much better than the November 2018 recovery that would have happened had the pre-2014 pace of job-growth in the recovery persisted. And yesterday it was reported that gross domestic product grew at an annualized rate of 4.0 percent in the second quarter. How excited should we be by all of this? Let’s take GDP first, since the story is pretty unambiguous: not very excited at all. Yesterday’s second quarter number was largely a pretty predictable bounceback from the disastrous first quarter numbers, which showed that the economy contracted at a 2.1 percent rate. Average these two quarters and you have the economy growing at less than a 1 percent rate for the first half of the year. This sad performance comes even as the fiscal drag from federal and state governments has relented a lot since 2013. It’s very hard to see us moving ahead of the same 2 percent growth in final demand that we have seen over the past three years. On jobs, the story is a bit better, but should be kept in perspective. The first three months of 2014 weren’t so great: the 190,000 average monthly jobs growth was right on the 190,000 monthly jobs growth of 2012 and 2013. The second quarter of 2014 was a lot better, but it’s not like we haven’t seen three month bursts of job growth comparable to this previously in the recovery. Below is a graph showing year-over-year jobs growth (in percentage terms) for each quarter since right before the Great Recession. The second quarter of 2014 saw the second highest percentage job growth in this recovery, but was far from off-the-charts. Some perspective from what everybody agrees was the historically jobs-poor 2001-2007 recovery and expansion: even that recovery saw three quarters with faster employment growth than any quarter so far in the recovery from the Great Recession. A higher gear in job creation would be most welcome, but really hasn’t shown up yet. Combining the jobs and GDP data for 2014 leaves one even a bit less confident. Simply put, GDP growth of less than 1 percent over 6 months is too slow to reliably lead to the 231,000 average monthly job-growth we’ve seen so far this year. This suggests that either GDP growth will pick up, job growth will slow, or, there really has been a pronounced collapse in productivity growth. Productivity—GDP divided by total hours worked—has seen its growth slow pretty consistently in recent years, even before the Great Recession. Yet because it is the quotient of two numbers (GDP and employment) that are enormously impacted by cyclical factors, it has been awfully hard to reliably infer what’s really happening to the productivity trend. In the long-run, it’s a very important question: productivity growth puts the ceiling on how fast average living standards can rise. An employment boom driven by an actual collapse in trend productivity growth would be a mixed blessing, for sure. Could the GDP data be wrong and/or ready to spring up to match the better job trends of the second quarter? We’ll see. Alternatively, tomorrow’s jobs report could drop off. Given that price signals from the labor market (i.e. wage growth) have been decelerating in recent weeks, I don’t think a jobs slowdown next month is off the table.